Location: Primm, Nevada. Home of what used to be the one of the tallest roller coaster in the world at 225 feet. Scenario: Dirt road behind and west of Buffalo Bill’s Casino, Storm Looming. 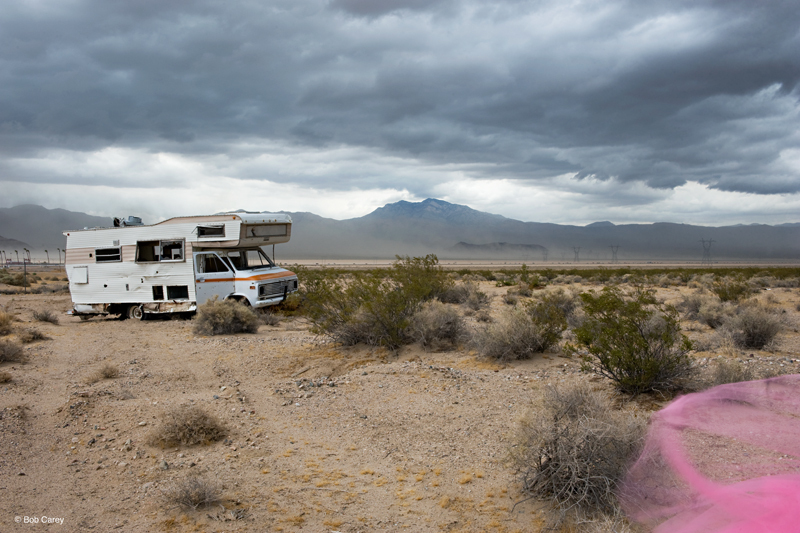 Me: Perfect location, awesome bullet ridden motorhome, the perfect storm. Me: I must set up my camera… I must shoot FAST, storm getting closer. Me: Storm is here, 50 mph winds, pouring rain on my very expensive rental camera. Me: I must run to my rental car and dry off my very expensive rental camera. Oh Sh*t! the road is turning into a wash and is flash flooding. Growing up in the desert I should know that this is not the right place to be! Me: I must drive real fast on the high side of the road and do THE most stupid thing I could possible- cross the wash!! I was in a rental car after all and my drivers ed. teacher was Mr. Brady so I could handle anything! Disclaimer: NO ONE SHOULD EVER ATTEMPT ANYTHING I JUST DESCRIBED HERE, EVER!! This image is the cover of Ballerina, Bob Carey’s collection of self-portraits, dedicated to women with breast cancer. Every purchase donates a percent to the Carey Foundation for women with breast cancer. I immediately thought Breaking Bad! …….does this mean The Tutu Project is recruiting Heisenberg for fundraising? Oh Bob I love it! Very cool. This is up there with the favorite shots. I knew it was shot in Nevada as soon as I saw this. Glad you made it out safe! Before I saw it was your project, I thought of Breaking Bad! lol I love this shot! Thank you for the nod toward Bad. Olivier yes! Saw it and love it!! CIn – what is all this about? That’s some scary stuff Bob! An Arizona boy should know better than to cross the wash . . . silly, silly TuTu! I saw this pic and thought it looks like NM and IT IS! I have not seen the show though.